There are many ways to be a fisherman. You can fish from the bank of a river, from the beach or out at sea. 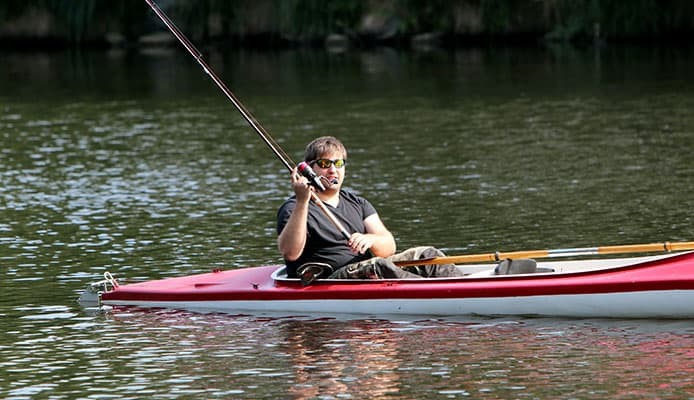 One way we would like to recommend is using a sit-on-top fishing kayak. Sit-on-top kayaks are more stable than their sit-in counterparts and are the perfect vehicle to cruise down a river looking for fish. 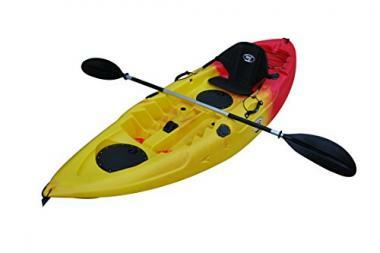 There are a large number of different kayaks available with a range of functionality. Whether you’re looking for storage space to carry supplies for a multiday trip or extra space to bring a second paddler along with you, there is sure to be a sit-on-top fishing kayak that suits you. SOT kayaks are a way that anyone can get out onto the water easily and without any training or knowledge. Being such a stable easy to use platform, they have developed into vital tools for fisherman and other adventurers! 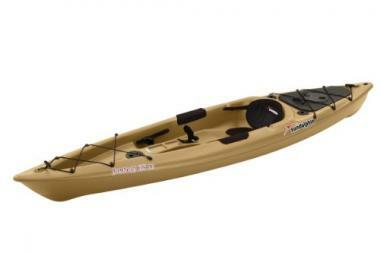 A great choice for a sit-on-top fishing Kayak is the 12 foot model from Pescador. 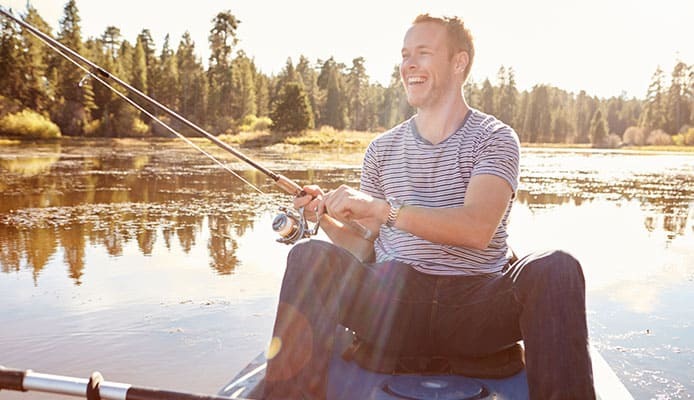 The kayak has been carefully designed with the fisherman in mind, providing extensive space for fishing rods and extra storage whether that be kayak helmets or spare shoes. 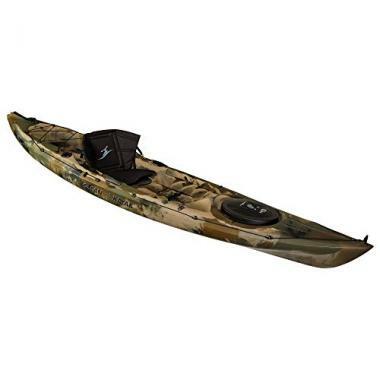 This Perception Kayak Pescador Pro 12.0 is short enough to still be easily maneuverable and is perfect for slow moving rivers, flat water lakes or even coastal waters with small waves. Another Kayak built for the keen fisherman, this Ocean Kayak Prowler 13 Angler 13'' design is perfect for covering large distances on long days of angling adventure. 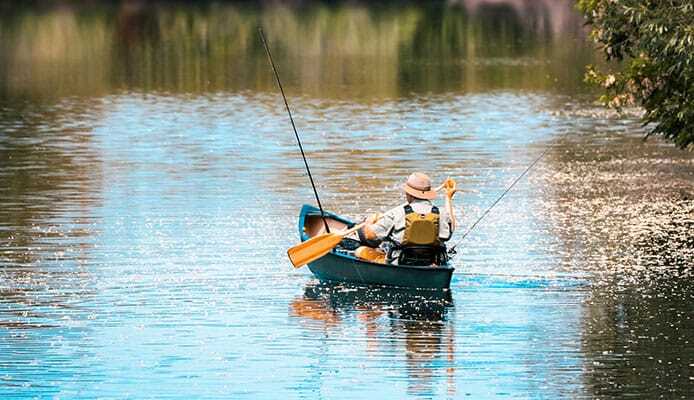 The almost flat top of the boat means that when fishing, you are free to move about the kayak and don't feel trapped and unable to maneuver in your catch. 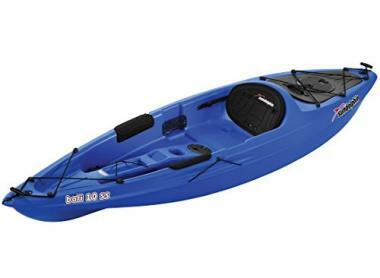 This 10 ft sit on top fishing kayak features a large comfortable seating area with a padded backrest. The shorter length of the boat makes it easier to turn and change direction. Despite this kayak's shorter size, it does not compromise on storage space offering both a dry storage compartment in the back and further space in the front. The BKC 2-person fishing kayak is the battleship of fishing kayaks. Seven individual rod holders line the side of this. Three of the rods are articulated, whilst 4 sits flush with the deck of the kayak but all of this means more lines, with more bait and more bites. With the two-person design comes some slight changes in layout. The BKC has two storage lockers located between the legs of each paddler. This makes them perfect for storage of valuables or easy to reach snacks. The BKC 9-foot kayak is the shortest kayak on our list but is a single man kayak which still holds room for 5 separate rods. There are three separate storage areas, 2 secure waterproof compartments in front of the paddler, one up at the front of the boat and one between the legs. Behind the driver sits a cargo area with bungee cords, perfect size for a tackle box or cooler. The lifetime 10-foot two-person tandem is a sturdy piece of equipment and comes backed with a 5-year limited manufacturer warranty. 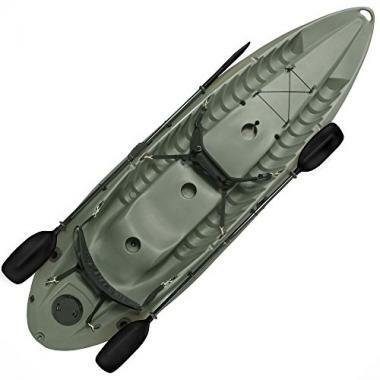 The kayak comes with 2 double-sided kayak paddles included, 2 padded backrests making space for 3 fishing pole holders and a 6-inch storage hatch. Slightly wider than the other kayaks on our list, the lifetime 10-foot kayak is a perfect stable kayak for beginner kayak fishing. This kayak is the only one in our list that comes with a rudder and foot-peddle system allowing you to turn and steer using just your feet. The kayak features enough storage for multiple days' worth of supplies, so for those who looking to spend some real time out in nature consider this option. The Sundolphin fishing kayak is a cruiser, it's sleek and minimal design makes cruising through peaceful backwaters easy and peaceful. The main seating areas offer depth, and paddlers will have the feeling of sitting within the kayak. The boat has three-rod holders in total. 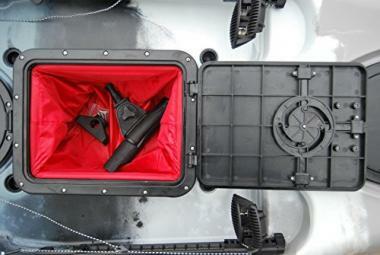 2 flush holders in the back of the boat with a swivel holder easier to access at the front of the kayak. The best material for a sit-on-top kayak is high density polyethene. Most sit-on-top kayaks are made from this tough and strong material so you don’t need to worry about the durability of your kayak, and it will stay sturdy for a long time to come. Storage and transport are two things that you have to consider when buying your kayak. Do you have somewhere to put it, and do you have something to get it to the water with? You may have to consider buying a roof rack or figuring out the best ways to transport your kayak. It’s best to check and consider what your capable of transporting before you go and buy yourself a hulking 13-foot kayak that you can’t take anywhere. Any seat that you’re going to spend hours if not days sitting in, you want to be comfortable. Depending on how you plan to use your kayak, this is not an option that you want to skimp out on. There’s no fun in going on a beautiful tranquil fishing trip and having to change how you’re sitting every few minutes. All sit on top fishing kayak reviews stress the importance of a good seat and Many of the kayaks we’ve reviewed here come with the feature. It’s worth reading about how other users have found different sizes of kayak and comparing that to your height. When out on the water or on a long multi-day adventure, you want to make sure that you haven’t left anything at home. Sit on top kayaks normally have two styles of storage area, watertight sealed storage areas and recesses lined with a bungee cord. The bungee cord cargo areas of a kayak often make a perfect place to store items stored in waterproof duffel bags. This means that you can store items on the deck of the kayak and still not have it get wet. The bungee cords ensure that there is no risk of anything falling overboard. The waterproof storage containers are a better location for those items that are a little more valuable and that are going to be a real pain if you lose. Think keys, wallet, mobile phone. Even when storing items in the secure watertight compartment it can be worth using some form of bag to stop the rolling around and make them easier to find. Stability is important, especially whilst fishing. Is your prized catch really worth you going over the side for? Hopefully, you’ve stored all of your valuables safely within the boat but realistically it’s not something you want to be doing. In order to find out how stable a boat is going to be, check how wide and how flat it is. These will be the determining features that will let you know how much the boat is going to rock when your hauling something in over the side. What Is A Sit On Kayak? Kayak’s come in many shapes and sizes. Sit on top kayaks have an open top, more room for storage and are generally more stable. Sit on top Kayaks make great fishing kayaks due to the stability and a large amount of storage space (perfect for multi-day adventures) and rod holders, which are often placed along the back and side of the kayak. The best sit on top angler kayaks also make room for more comfortable seats, very important when you’re going to spend all day sitting in them. How To Care For Your Sit On Top Kayak? Taking care of your sit on kayak is relatively easy and does not require much work. Firstly, if you use your kayak in salt water, it makes sense to rinse it off once you get back to dry land. This becomes even more important if storing it for the winter or extended periods of time. Secondly, have a place to store your kayak indoors. Garages or sheds are perfect for this kind of thing, the most important thing is to get it out of the elements. What Kind Of Accessories Do I Need To Buy For My Kayak? First off check what accessories your kayak comes with. 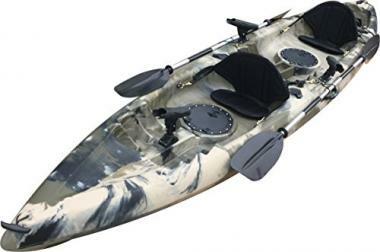 The best sit on top fishing kayaks come with built-in adjustable seats or basic rod holders. You may need to buy a paddle if not included. Other things to consider are waterproof bags to store anything that you need to keep dry, buoyancy aids if you plan on paddling further afield, or a racking system for your car if you’re going to be transporting your kayak over large distances. As with many of these things, the first thing to consider is what you plan on using your kayak for and where you are going to be taking it. Whatever you decide, however, there are almost certainly accessories available due to the growth in kayak fishing in recent years. Kayaks are fun. Fishing is fun. The two make a great combination. For those who are looking for a longer trip or multi-day adventure, the kayak offers the perfect vehicle. With ample room for storage of tents, food or fish gear, the kayak becomes a mobile platform to enjoy the outdoors. There really are few things better than drifting down a river, with a YETI cooler full of snacks and fishing lines out the back, we couldn’t recommend it enough.